Preparations of Praga and trade fair Collector under way. Best wishes for the New Year ! ! ! Prolongation of the deadline for Application forms till 31 October 2007 ! ! ! The deadline for applications for the exhibition PRAGA 2008 is approaching ! ! ! The Postal Museum was founded on 18 December 1918. Just a few weeks earlier, on 28 October, with the ending of the First World War, new European states were created taking the place of former Austria-Hungary, one of which was Czechoslovakia. 18 December 1918 has yet another symbolic meaning for the postal history of the new country, since that was the day when the first Czechoslovak postage stamp was issued. That stamp depicted Prague Castle after a design by the world-famous art nouveau painter Alfons Mucha. The founder of the Postal Museum was the erstwhile Ministry of the Post and Telegraph, and the museum remained under the Ministry of the Post and Telecommunications practically until the end of 1992. With the fall of the Communist regime in 1989, there took place a process of gradual dividing up of the postal and telecommunications services owned and directed by the state and their partial privatization. This process reached a climax in 1992 with the privatization of telecommunications and radiocommunications and the formation of an independent state-owned company Czech Post on 1 January 1993. On that same day, Czechoslovakia was divided into two independent states – the Czech Republic and Slovakia. The Postal Museum in Prague became part of the state-owned company Czech Post. From the beginning, the Postal Museum’s collecting activities have focused on obtaining physical exhibits and written documents showing the wealth of the centuries-long history of postal services, dating back to 1526 in Bohemia and Moravia with the founding of the first postal route from Prague to Vienna in connection with the election of Ferdinand Habsburg as the King of Bohemia. 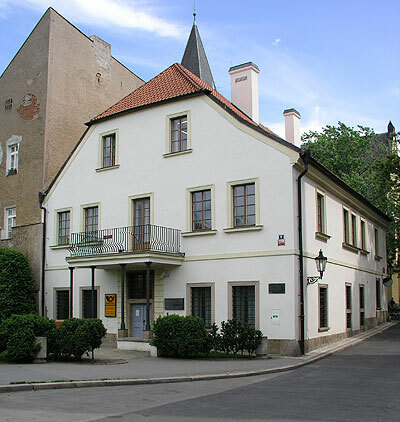 Purchases and gifts from eminent persons allowed the museum to create a collection very quickly, enabling the opening in 1928 of the first temporary exhibit in the ground floor of the venerable Carolinum Hall and in 1933 of a permanent exhibit at the former St. Gabriel Monastery in Prague-Smíchov. 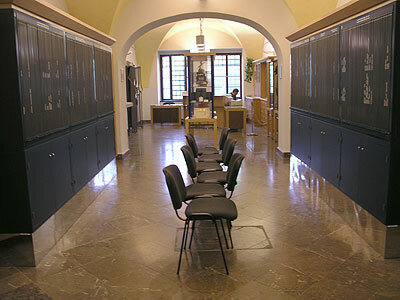 At the same time, the museum founded a large postal library that was open to the public. Postage stamps were an integral part of the museum’s collections. The war years noticeably hindered the museum’s development, including its forced closing in 1944, but the museum suffered the most during the period after the Communist putsch in 1948. The museum’s exhibits were successively closed, and the collections were put into temporary storage on unsuitable premises. The renewal of the museum’s activities to their original extent did not come about until the second half of the 1960s. 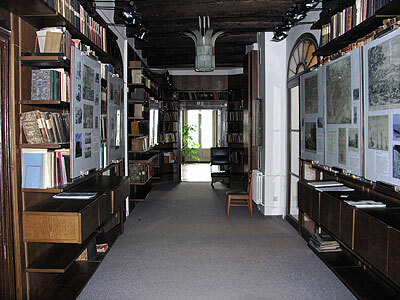 In 1976, an new postal and telecommunications history exhibit was opened in the former abbey of the Cistercian monastery in Vyšší Brod, a little South-Bohemian town near the Austrian border. In 1988, the museum found a new home in Prague in a 17th-century building. 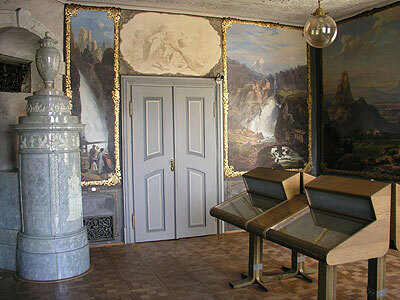 The philatelic collections, library and reading room were housed here, and the museum holds occasional exhibits here. The inventory of the Postal Museum’s collection lists nearly 200,000 items, some of which consist of the numerous sets of individual collector items of the same kind. The entire collection of the Postal Museum is listed by the Czech Ministry of Culture as being a part of the national cultural heritage. In the exposition of the Postal Museum in Prague, one finds a wealth of postage stamp collections. Besides a complete collection of Czechoslovak and Czech Republic stamps, there are also exhibits of classic European postage stamps, including a study collection of classic Austrian stamps that is greatly valued by philatelists. Another pride of the collection is the world’s first newspaper stamp – the Austrian Merkurs. The Postal Museum owns the world’s only block of eighty so-called Blue Merkur stamps, which is exhibited only on special occasions. Also important, and available for public viewing, are a collection of so-called Russian Zemstvo stamps, a bequest to the museum from the architect Lada–Yakushevich, a descendent of emigrants to pre-war Czechoslovakia, and stamps of old German states. The Postal Museum building in Prague also occasionally serves as a venue for presentations during exhibitions. Each year there are five or six such exhibitions presenting the artists and engravers of Czech postage stamps, showings of historic and philatelic museum collections, and exhibits that are the result of international cooperation. For example, in 2006 the museum presented an exhibit from its partner postal museum in Slovakia and an exhibit of postage stamps from the Republic of France. The postal history exhibition at the Postal Museum’s branch in Vyšší Brod presents postal history from medieval courier routes through to the present. The museum covers an area of ca. 1800 m2 , and visitors can see a varied collection of postal uniforms, post office signboards, mailboxes, post office counters and various other objects from the interiors of post offices, including a collection of pictures. Also interesting are displays of historical postal machinery. Among the most valuable exhibited objects are a baroque-era engraved sign from a late-17th-century post office. The most popular exhibit with visitors is undoubtedly the collection of carts and carriages. The Postal Museum is a member of the International Association of Transport and Communications Museums (IATM). It is a member of the Conference of the European Communication Museums, and it takes part in the work of that organization. Since 2004 it has been a member of the Club of Monte-Carlo of the Philatelic Elite (Club de Monte-Carlo de l'élite de la philatélie) in Monaco, where it regularly takes part in MonacoPhil exhibitions. Head of Postal and Telecommunications History Dept. What stamps will be issued for the world exhibition? What other stamps will there be for the World Exhibition?